Teachers have one of the toughest and most important jobs out there. They love, instruct, correct, encourage and counsel. It’s a high calling that deserves all the gratitude we can offer. So how can you use your God-given gifts to serve and bless the teachers in your life? Encourage teachers to enter Dave Ramsey’s Teacher Appreciation Giveaway! Teachers have one of the toughest and most important jobs out there. Every day they herd gaggles of kids. They love, instruct, correct, encourage and counsel. They spend their own time and money transforming their classrooms into adventures of learning. And they help prepare these little people for the big world they’re getting ready to enter. It’s a high calling that deserves all the gratitude we can offer. “Each of you should use whatever gift you have received to serve others, as faithful stewards of God’s grace in its various forms. If anyone speaks, they should do so as one who speaks the very words of God. If anyone serves, they should do so with the strength God provides, so that in all things God may be praised through Jesus Christ” (1 Peter 4:10–11 NIV). So how can you use your God-given gifts to serve and bless the teachers in your life? Here are six ideas. God is the ultimate artist, and since He created us in His image, we often feel called to creativity too. If that’s you, make something special for your child’s teacher: a painting or drawing, a blanket or pillow, a knitted hat or scarf. Better yet, have your child pitch in to put a sweet touch on a personal gift their teacher will treasure for years to come. Teachers spend an average of $513 of their own cash on classroom supplies and materials each year. That’s crazy! If God has blessed you with a surplus of your own cash, consider using it to buy the things teachers keep in stock: paper, pencils, tissue boxes, crayons, glue and other items. Assemble them in a pretty basket. You can even include a few extras for the teacher: snacks, tea, and maybe some aromatherapy goodies for de-stressing. If you’re not sure what to buy, include a gift card to your local teacher supply store or even a local spa or coffee shop. Have you been told you have a way with words? Is your little one a budding author? Write a thoughtful thank-you note, or ask your child to pen a story or song just for their teacher. Use fancy stationary or pretty paper. It’s simple, but these are the kinds of keepsakes teachers hold on to! Garden imagery appears frequently in the Bible, and reaping a harvest out of the soil was the first task God assigned to humanity (Genesis 2:15). So it’s no surprise that you might feel most connected to God when you’re digging in the dirt. If your gift is a green thumb, cut some flowers from your garden and arrange them in a pretty vase to send with your child to school. Or if your garden is edible, harvest some fruits or veggies and place them in a decorative container. You might even include some recipes featuring the produce you’re gifting. Talk about an upgrade from the standard red apple! If friends have offered to pay you to bake and decorate fancy cakes for them, or if you could whip up a batch of cookies with your eyes closed, God may have made you a gifted baker. Use that gift to bless a teacher with some sweet treats. They’ll be a welcome change from the store-bought stuff going stale in the teachers’ lounge. Okay, so God gave you gifts, but maybe you’re still discovering what they are. If you don’t know what to give the teachers in your life, how about the chance to relax on a dream vacation? Encourage them to enter Dave Ramsey’s Teacher Appreciation Giveaway. The grand prize is a $5,000 vacation for two! What teacher wouldn’t love that? What gifts has God given you? 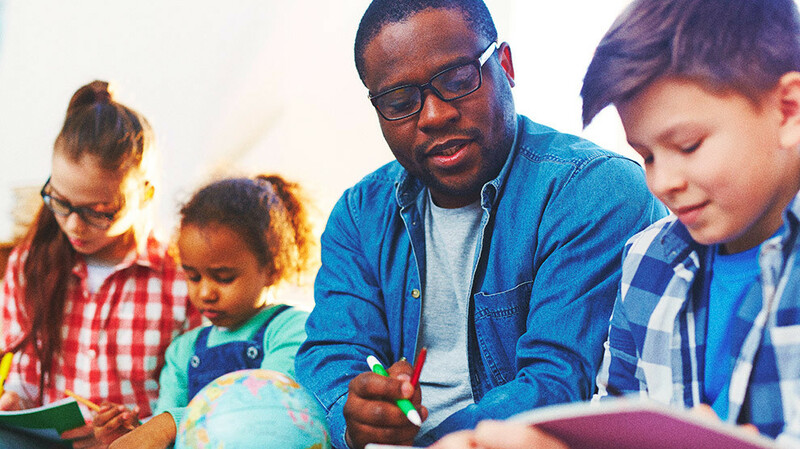 Take your greatest talent and turn it into a way to say thank you to your child’s teacher before the school year comes to a close. Dave Ramsey’s Teacher Appreciation Giveaway, sponsored by Churchill Mortgage, runs throughout the month of April. Teachers can enter for a chance to win a $10,000 teachers’ lounge makeover, one of three $1,000 gift cards, a school assembly with Ramsey Personality Anthony ONeal or even a $5,000 vacation for two! Teachers can enter now through April 30, so share this giveaway with the teachers in your life today!